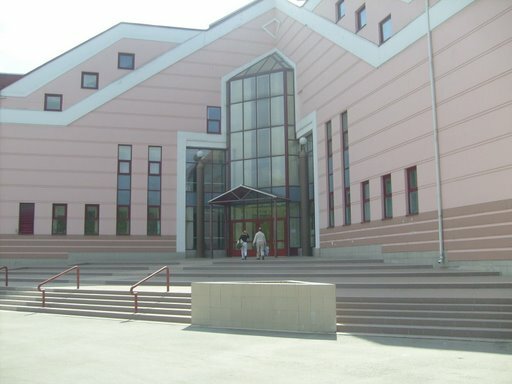 The conference is held in the Academic University (AU) of the Russian Academy of Sciences. Workshops are held on June 12-13 in St. Petersburg Department of Steklov Institute of Mathematics of the Russian Academy of Sciences (PDMI). On June 14-18, at 8:30 in the morning there will be a shuttle from main entrance of the Oktyabrskaya hotel to AU. Please note that if you have registered as a regular participant we will meet you at the airport (in this case please make sure that you send us your arrival time). Order a car to Khlopina 8 corpus 3 (in Russian: улица Хлопина, дом 8 корпус 3). Go to the Ploshchad Muzhestva (in Russian: Площадь Мужества) subway station and use the map below. 1. Get off the subway and turn right. 2. Go straight ahead along the road. 3. 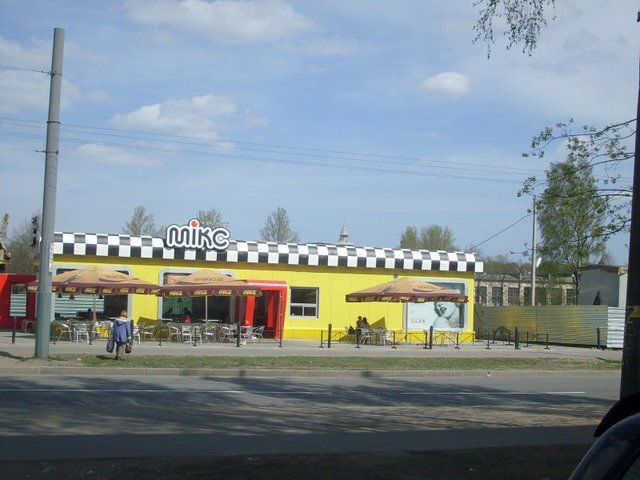 Pass by the cafe "Mix". 4. 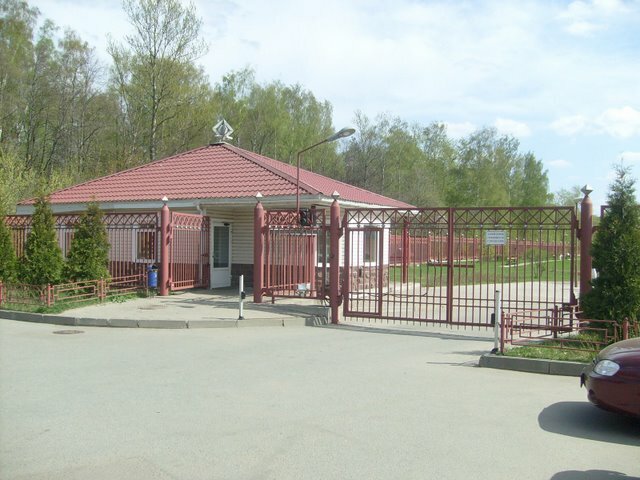 Pass by the sports complex "Polytechnic". 5. 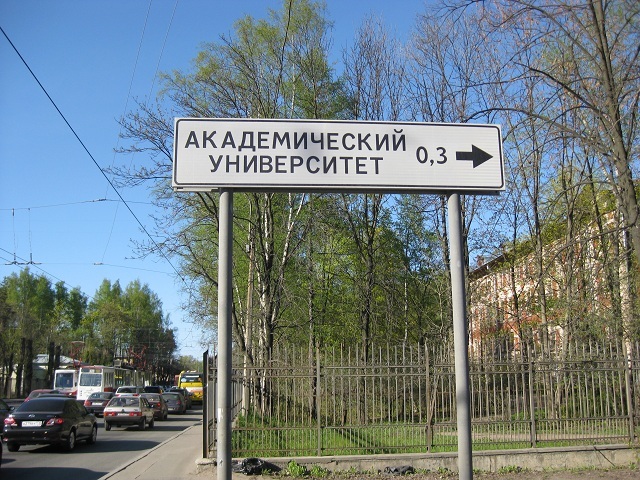 Turn right when you see a sign "Академический Университет" (Academic University). 6. Go through the gate. 7. Go straight ahead to the main entrance of the conference building. 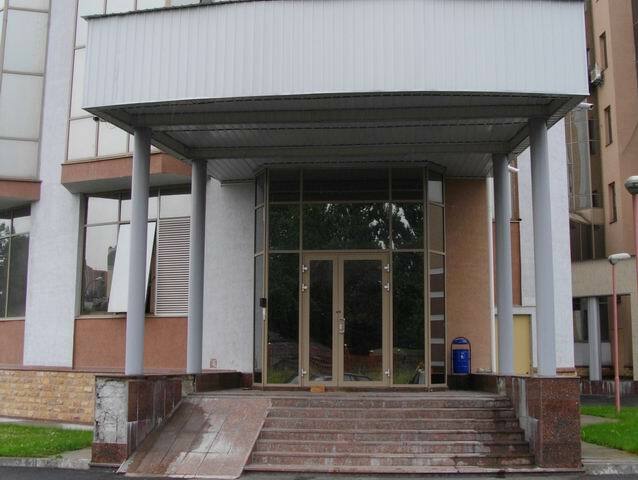 The address of Petersburg Department of Steklov Mathematical Institute (PDMI) is Fontanka 27 (in Russian: наб. 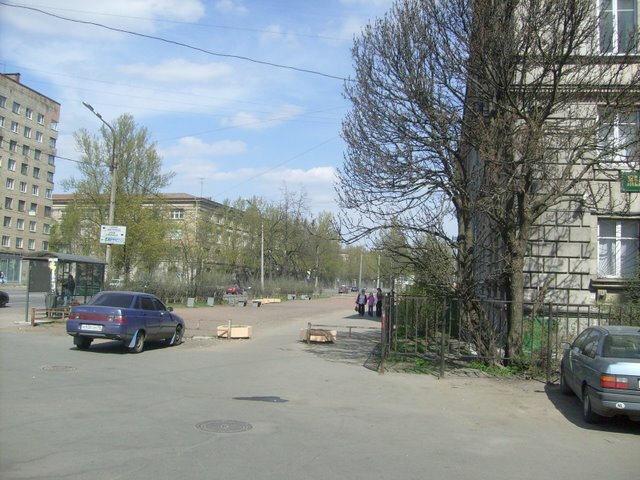 р. Фонтанки, дом 27) — just near the cross of Nevskii prospekt and Fontanka river. It can be reached in 10-15 minutes walking from the following subway stations: Gostinnii Dvor, Nevskii prospekt, Moyakovskaya, Ploschad Vosstaniya. The closest one is Gostinnii dvor. The map below shows a way from Ploschad' Vosstaniya to PDMI. Here is the plan of the AU campus with three paths shown. The blue path goes from the gate to the hotel. The green path goes from the gate to the conference building. The red path goes from the hotel to the conference building. 1. 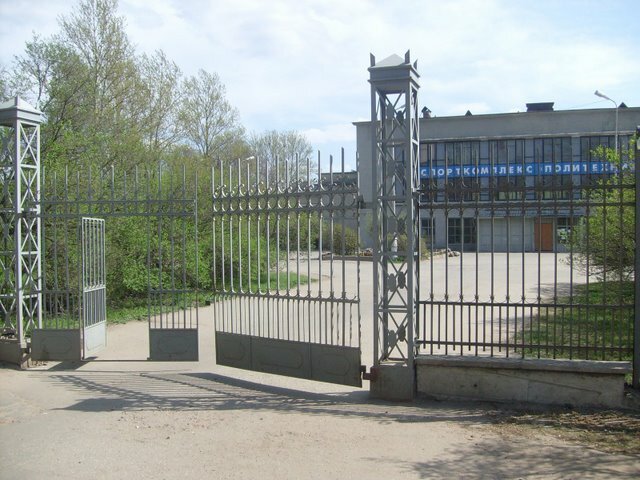 The entrance gate to the campus. 2. The entrance to the conference building. 3. The entrance to the hotel. Places of interest on Saint-Petersburg.com, on wikitravel. Below is an incomplete list of cafes and restaurants close to AU. There are much more restaurants in the city center. 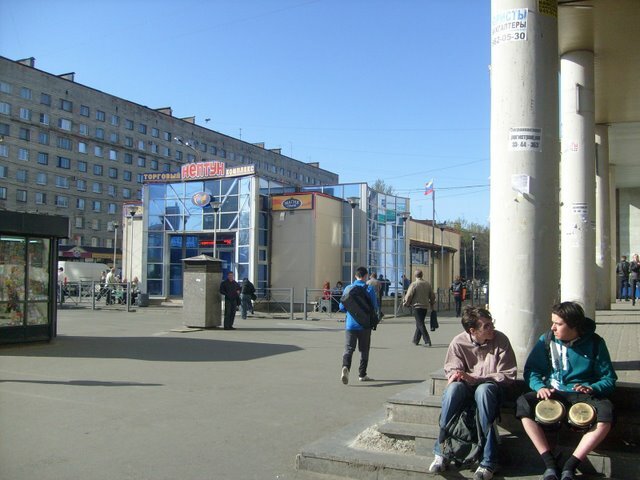 There are lots of them between the subway stations Ploschad Vosstanyia, Nevskiy prospekt and Sennaya ploschad. 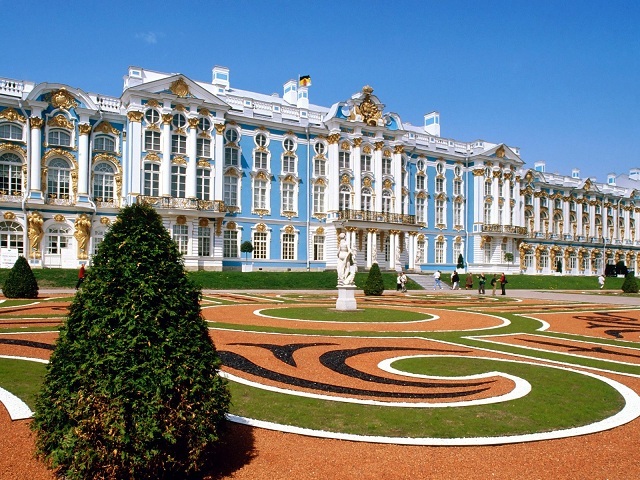 On 15th June, we will have an excursion to Pushkin. The bus will pick up the conference participants at the entrance gate to the AU campus at 14:15. The conference dinner starts at 19:00 on 17th June at the Lesnoe cafe, Politehnicheskaya, 29. The two nearest subway stations are Politehnicheskaya and Ploschad Muzhestva. After you enter the St. Petersburg underground you can unlimitedly move inside, paying only once, on entrance. A single-trip token costs 25 rubles and goes into a special slot on a subway turnstile. Another option is a smart card with some preset number of trips; to pass, you should bring it to the white circle located on top of the turnstile. If you need more trips, you can extend your card in the ticket window at any time (25 rubles/trip, a little cheaper if you buy many trips). Please, do not take photos or record videos in the underground: it is prohibited and may cause trouble with the police. It is a good idea to stick to the right side of the moving stairway – those in a hurry come rushing down the left side. The doors are automatic, so in case of a crowd, watch out not to get your clothes stuck. In municipal buses (numbers without letters T or K), trams, and trolley-buses you should pay a ticket-collector (he/she will most often wear a red arm-band and orange jacket). One ticket costs 21 rubles. NB: You do not need to punch the ticket. NB: This transport has only regular stops and you can not get out wherever you want, so do not try to find a stop-button or pull the emergency brake. NB: It does not matter which door you use to come in or out except buses without ticket-collector: in such situation you should pay a driver and leave through front door (you won't get mistaken because in these buses only the front door opens at first, and the other doors open when passengers have already left the bus). In commercial buses (marked by letters T or K) you should also pay a ticket-collector, while in minibuses you pay the driver when you enter. At some (bigger) buses you pay the driver when you exit. The price depends on the line (usually 30 rubles), and it is always clearly marked on a label. You may get a temporary local mobile phone number for 200-300 roubles - you need only your passport for this. It can be done in any communication service, for instance there is one called "Евросеть" (EVROSET') near the Ploshad Muzhsestva subway station. As for the service providers, Megafon and MTS provide slightly better coverage (no difference in the city, but far-away suburbs may get better reception), while Beeline and TELE2 are cheaper. 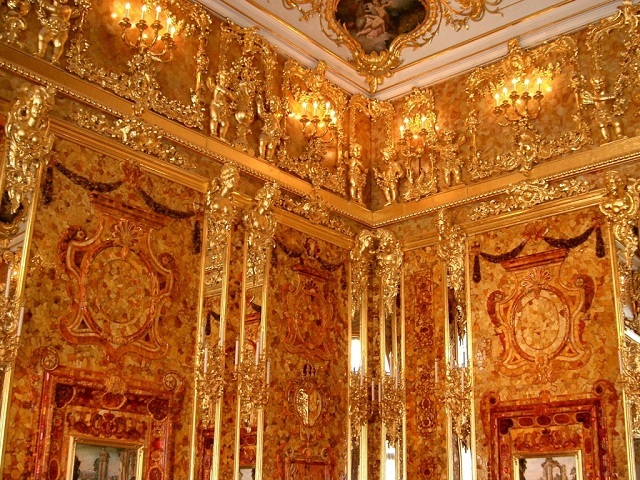 There are a lot of places of interest in St. Petersburg. Only a few examples are given below. do not cross the road in inappropriate places (the drivers are absolutely not polite) and be careful even when a crossing is marked.